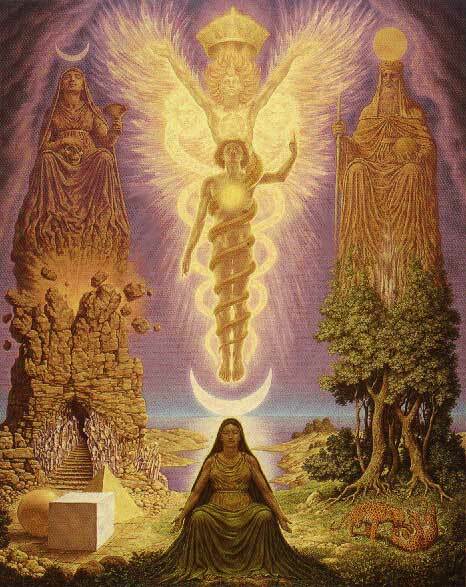 Gnosis means knowledge in Greek. I will say something about my understanding of Gnosis in the way I came to know this concept in the last several years. This is written on the entrance of the temple of Apollo in Delhi, Greece. This phrase in short says what Gnosis is about. It’s about attaining the knowledge of the Universe through the knowledge of oneself. It is not a type of knowledge that we can get by reading it in a book – that is not knowledge, it is information we read. Rather, knowledge is something we directly experience. Self-knowledge is a knowledge we get by observing our inner world of thoughts, emotions, drives, impulses and all other subconscious elements that we can perceive. This is done by self-observation, a technique taught in Gnostic teachings. With it we start seeing things that are happening within us, things that are driving our actions and which we are not even aware of. We start seeing dark elements of subconscious, such as anger, jealousy, negativity, fear, greed, pride etc. Usually those aspects are thought of as being a part of human nature, something that we just happen to have and need to learn how to live with it. However, that is not so. These elements are not permanent part of who we are. The core of who we are is the consciousness, a spiritual spark. So the emotions and thoughts are just things stuck to our psyche, and they are things that we can change. We can change the nature of our psyche by transforming those negative aspects of ourselves. Within them are parts of our consciousness, and by eliminating the negative aspects we set those parts of consciousness free and in this way the consciousness grows. That changes everything. The way we perceive world is different, our understanding increases, we see deeper into things, we see more, we get more power to detach from negative states when they manifest, we start seeing that same divine spark in others, we start feeling more compassion and love for others etc. There is one more powerful technique that is like a circle around all other techniques for transformation, and that technique is alchemy. It is a sexual practice between husband a wife for purpose of transformation of internal energies and more. In this way then, by applying techniques such as self-observation and elimination of the negative inner states (and later on alchemy), we start getting self-knowledge. We start to know about the enslaving negative forces within us, and we also gradually know the core of who we are. And then, according to esoteric teachings, we start to know “the Universe and the gods”, because all life in its core is of the same substance. But to truly know who we are is a great quest, and it takes a long time of dedicated effort to attain that great knowledge. Thank you for explaining Gnosis so clearly. I think this really helps to understand what Gnosis is all about. The links are quite beneficial too.